Yesterday I woke up feeling focused and renewed. I have been naughty over the last few weeks and have really fallen off my healthy wagon. What with all those Easter eggs and Hot Cross Buns in April and then my trip to Seville where it would have been rude not to try the local delicacies including 'Churros' (a type of Spanish doughnut which is dipped in hot chocolate) for breakfast....every day. So it was finally time to get my act together. Fresh seasonal fruits for breakfast always perk me up and set me up for the day right. 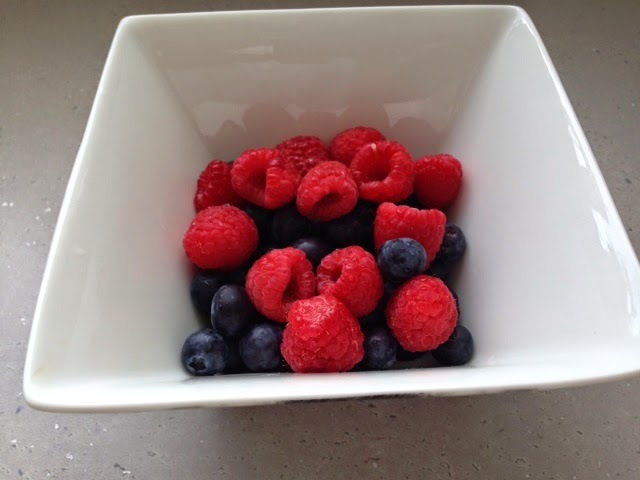 I had this bowl of blueberries and raspberries followed by a small passion fruit - delicious. Blueberries are a great 'superfood' and are known for their high antioxidant capacities- they also taste great and are brilliant as a little snack in between meals. You could also have the fruit with some good quality natural yoghurt poured over the top, sprinkled with some flaxseed which is said to have a high Omega-3 content -good for your cardiovascular system. I don't normally buy Passion Fruit but was tempted after having a gorgeous Passion Fruit Pavlova (naughty again!) at a restaurant last week. It had a slight tang to it which I found very interesting and the consistency wasn't very appealing...frogspawn come to mind anyone? 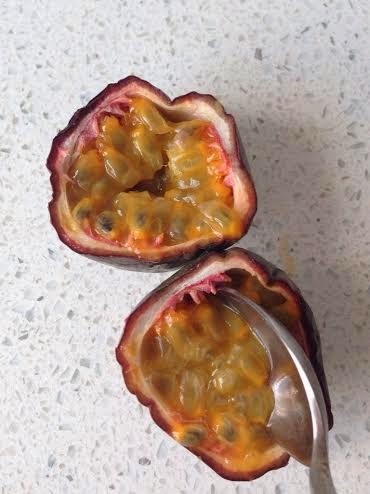 !...but it's exotic, tropical flavour is the real draw and makes this delightful little fruit very 'moorish'. After going out for a nice long walk to clear the cobwebs, I came home and made this very quick dinner of baked sweet potato chips with a little soured cream-perfect on its own, or if you choose to, with some protein like grilled chicken or baked fish. 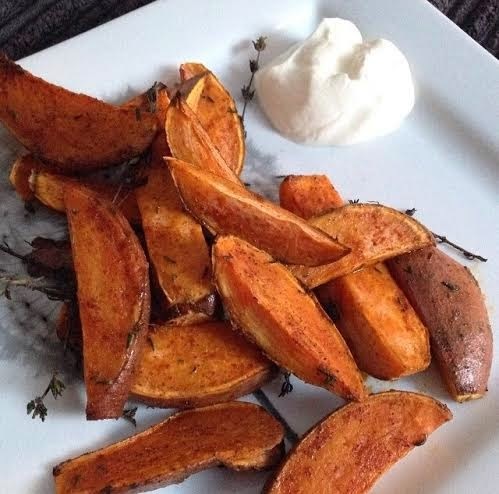 It's so easy to make, just cut some sweet potato into thick wedges and place in a baking tray. Sprinkle some Olive Oil over and for a little kick, I added some Paprika and dried Thyme. Toss together making sure all wedges are coated and then leave in the oven until crisp and golden. Before I went to bed, I had a nice mug of warming ginger tea. The one I have is made with granules instead of a bag and the flavour is so much more intense- it really takes the edge off any sweet hunger pangs I may get in the evening. Now the weather is getting warmer, it inspires me to want to eat more fresh, seasonal and less stodgy foods. With so many new fruits and vegetables in season its easier than ever to get inspiration for light summer meals and snacks. What is your perfect healthy summer meal? What health kick tips do you have?